It has been a week since I am back from LEC and I have thought to share a chunk of my experience I have gathered in my first contact. Before going into the course I had apprehensions in my mind regarding the course. I was also curious enough to know about the course content, design, faculties, mentor and the structure. The first thing that struck me was the ambience of the room and the place outside the room. It is in LEC I first wrote my name on a dryleaf and hung it .The moment I step inside the room it was a different world. A world of books! Books all over. I always used to complain I am not able to read any book due to my bad time management and workload. Thanks to my poor mobile network which enabled me to concentrate and enjoy the course fully.I could feel that my days will be all around the books. My first spell of library was cast by my mother who loves books. I was asked to set up a corner of my room as a library. The word library till then was meaningless. Though there was a class allotted for library, I never find it interesting. I used to enjoy my storybooks and the story telling sessions with my grandma and my mother more. My mother taught me to arrange the books in order and label them properly. I was thrilled with my little library which was later shared with my brother. This miniature library later took me to the big public libraries in Kolkata at later stage of my life. But I have never had an experience of a true library and its components till I joined LEC. The sessions were very rich indeed. Jane Sahi’s session on language where she drew a comparison between sound and words was the first thing which led me to think critically. Music and words are strongly associated. Words come from sounds. Sounds are like musical rhythms .Sounds are the power of interpretation. Even if language is not known the sound plays an important role to interpret it. These were few things so nicely being mentioned by Jane in her language session. 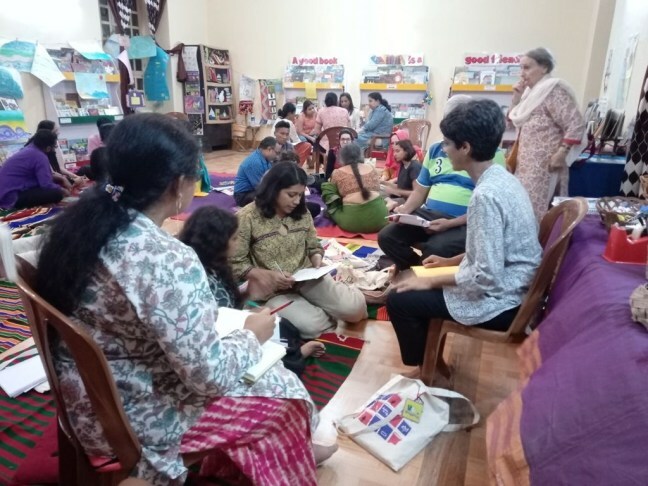 The other sessions were also quite enriching as each session had given us ample scope to read a lot and talk about each reading. The Book Talk led us to recommend the books for others and talk about the central idea of the story and its illustrations. 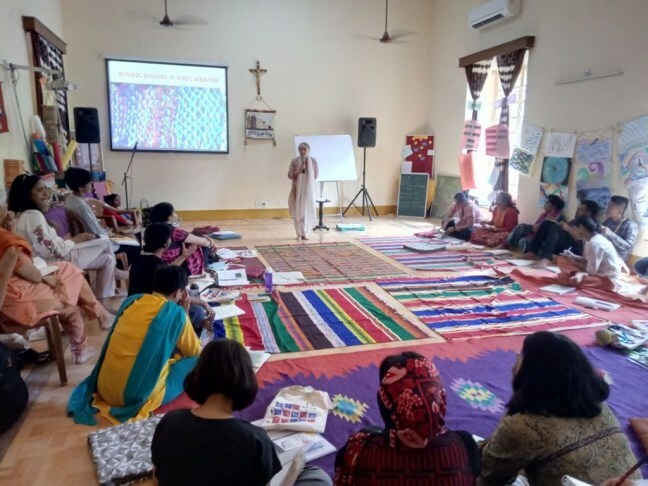 The sessions were activity based and the planning was done quite systematically. The reading sessions on each day gave us ample opportunity to grab the books and internalize the stories. Often we sat and discussed the stories with others and exchanged thoughts among us. Lastly Asthachal which I call Me-time was the most striking moment for me. That silent half-hour with myself was remarkable for me. As a teachers’ trainer I always ask teachers to give time for self but unfortunately never thought of myself. This was the time which gave me utter peace of mind with a note of music coming from the church while viewing the beautiful sight of a setting sun. The books were varied and the library had a rich collection. 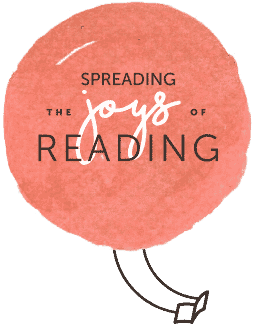 Some of the books which I should recommend are Fly Away Home by Eve Bunting, Sadaku by Eleanor Coerr, Wings to fly by Sowmya Rajendran, Walking Through the hills by BulBul Sharma. KannaPanna by Zai Whitakar is a beautiful story about a differently abled boy. Never in the book it has been mentioned that the boy was blind and the illustrations also were made so meaningfully. The reader has to read the book minutely to find out the boy’s disability. The implicit message of inclusion has been voiced by the author through the little boy. On this same issue another book I find quite interesting is Catch the Fish by Thami Viswanath. There are many others also like Ahmed and the Feather Girl by Jane Ray an Egyptian story which talks about violation of child rights and the practice of Child labour has left a lasting impression on my mind. It is true that although I am assigned many deliverables in my organization,LEC’s experience has really given me insights that will stay with me. Even the knowledge and experience I shall be incorporating in my work ahead. Lastly, I am really looking forward to gain much more from the course. Almost a week gone after the first contact period! While I was rapidly trying to meet deadlines at work, I get a mail from Beena to write something about the enriching experience in Goa. Before boarding the flight to Kolkata, I stopped at a famous bookstore. The kind of books they had again left me wandering how politicized the market is. Since the day I came back, I have shared snippets of my journey over coffee and lunch with friends and colleagues. Everyone started sharing their own childhood memories of libraries and books. I would say that a major part of the contact period compelled me to think and dig deeper. LEC was a journey to find the right kind of balance of sound and quiet that maximized our awareness of why we do what we do. It was an invitation to understanding of library and books, especially children’s literature. To begin with, I always had the misconception that picture books with beautiful illustrations or books with a few words are meant for children. How easily I labeled them, without realizing their enormous ability to invite empathy and self reflection. Such books sow the seed deep in our minds and bloom again and again throughout a lifetime. They are books for all of us and for all time. I would thank LEC for breaking this silly notion of mine. Secondly, the session on memories was quite challenging and my inability of not recalling my childhood was quite frustrating. This question has somewhat stayed with me. The only vague images that occupy my mind while thinking about a school library is of a word that says aloud “SILENCE PLEASE”. It was all over the place and was quite daunting for me as a child. My personal experience with library is quite limited. We had a school library and a library period. I felt it was just another period in the daily routine. I was never a voracious reader and did not like the idea of searching for books from the shelves. When I was in standard 7 or 8, I remember my friends borrowing Harry Potter series from the school library, while I was lost in the world of JR Tolkein’s ‘The Lord of the Rings’ gifted by my brother. I lent my book to one classmate which she never returned. That was my heart wrenching moment for losing a book for the first time. But then I learnt to let go. The biggest turning point was the day I joined a private school as a teacher, situated 200 kms away from Kolkata. 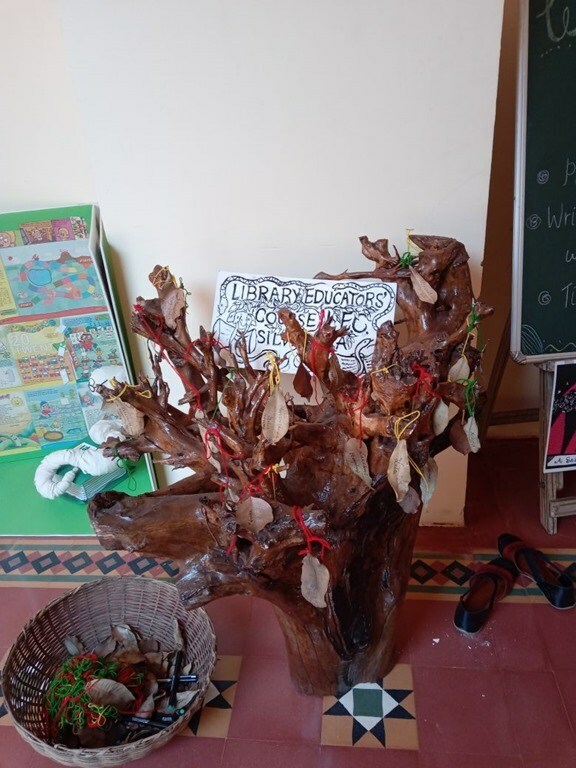 There were conscious efforts to engage teachers into various reading activities. This was one factor that influenced my reading habits. It is only now that I have turned into a frequent reader. When I look back at my childhood, I feel that the role of the library was quite passive in turning non readers into readers. I raise this point because we often assume if we are surrounded by books or have a library will naturally make us readers. But as a matter of fact, it is the lack of initiative and activities which failed to attract that section of students. How words come into being? -what is our focus – the former or the latter? 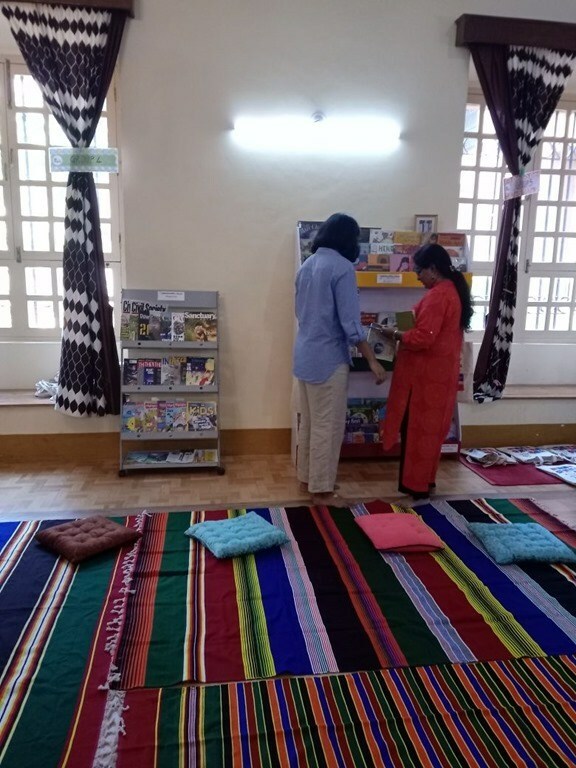 I closely work with the American Center in Kolkata and it has a pretty decent public library with a ‘youth corner’. Last year, along with an English Language Specialist and other coworkers, I conducted a Scavenger Hunt in the library where students explored the library space and the available resources. In some way, it helped students to avail membership in the library but it was a very small section. 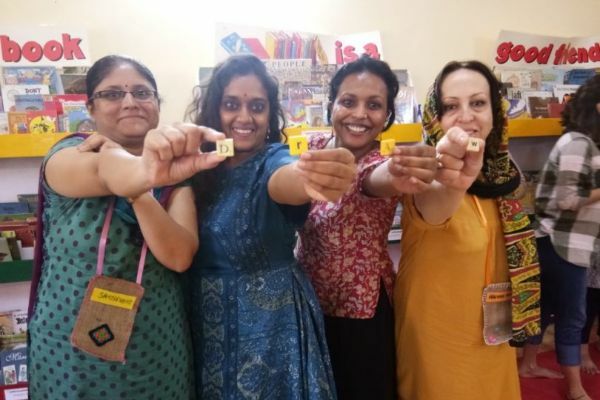 The library professionals are trying hard to attract more users, especially school students of government schools. Because government schools in the city have either non-functional libraries or none at all. The very structure of the Centre is intimidating where one has to go through tight security check. Also, I have never really looked at their collection closely and critically. LEC has guided me with the questions to be asked while examining books in a library. In addition, the library games at LEC were so well thought out. I cannot wait to try and improvise these excellent games with students in the upcoming month. I did’nt think orange went very good with purple until I saw the sunset you made on Tuesday. That was cool. 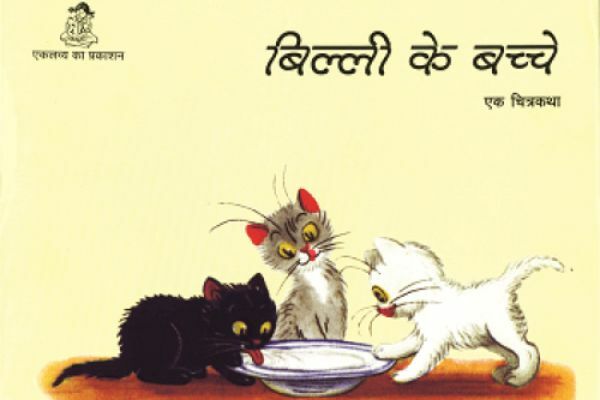 Children’s books are kind of wedded to animal stories and characters. Sometimes as themselves, sometimes as humans – animals perhaps come close to human experience of emotions of all kinds, except that animals in stories often speak the human language in words which may not be true in real life. I saw Ludwig Mies van der Rohe’s aphorism ‘God is in the detail’ come alive as I walked into the LEC 2018 classroom in the St Joseph Vaz Spiritual Centre in Goa.